Healthy Fruit & Chocolate Party Tray is a fantastic appetizer for your next get-together. 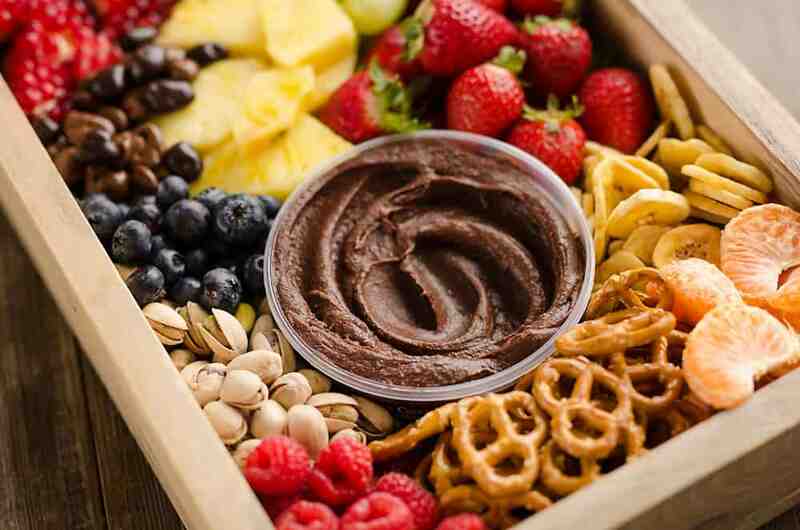 A wholesome mix of fruit, nuts, pretzels and more are served with Boar’s Head Dark Chocolate Hummus for a selection of elegant and delicious finger food. I was watching a Food Network competition recently and one of the challengers made chocolate hummus. The judges were all raving over how delicious it was so it piqued my interest. When I saw this Boar’s Head Dark Chocolate Hummus at the grocery store, I had to give it a try. I honestly wasn’t entirely sure what to expect, but after I got it home and gave it a try, I was hooked! It was smooth, creamy, chocolaty and the perfect accompaniment for this Healthy Fruit & Chocolate Party Tray. 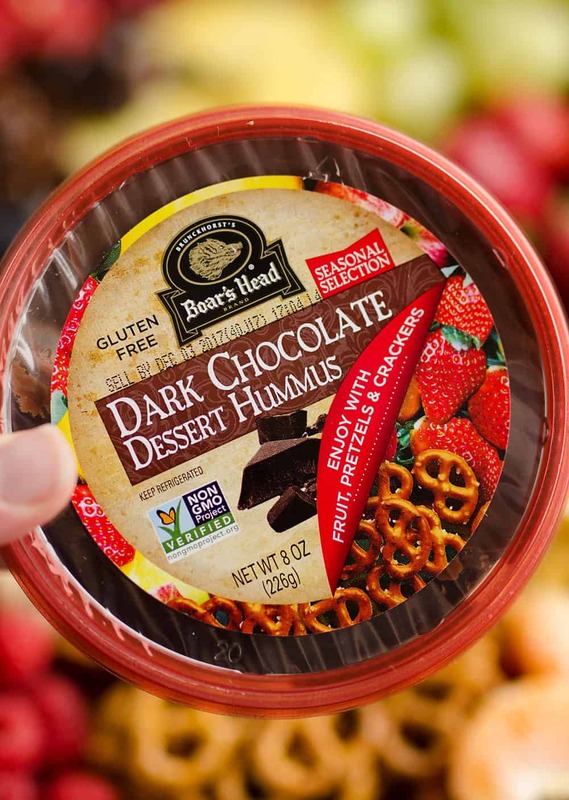 If you are looking for a guilt-free snack or a unique item to serve at your next gathering, this Boar’s Head Dark Chocolate Hummus is a must-try. It’s made from steamed chickpeas blended with cocoa powder, organic sugar, and real vanilla for a wholesome treat. You might be questioning me right now, wondering how chocolate and hummus go together. While most of us are used to eating hummus in a savory fashion like these Boar’s Head varieties, the sweet version is a new concept that is a real winner in my opinion. There is no savory element competing with the sweet chocolate. It is simply using the steamed chickpeas, which have a mild flavor, as the base to this creamy dip. 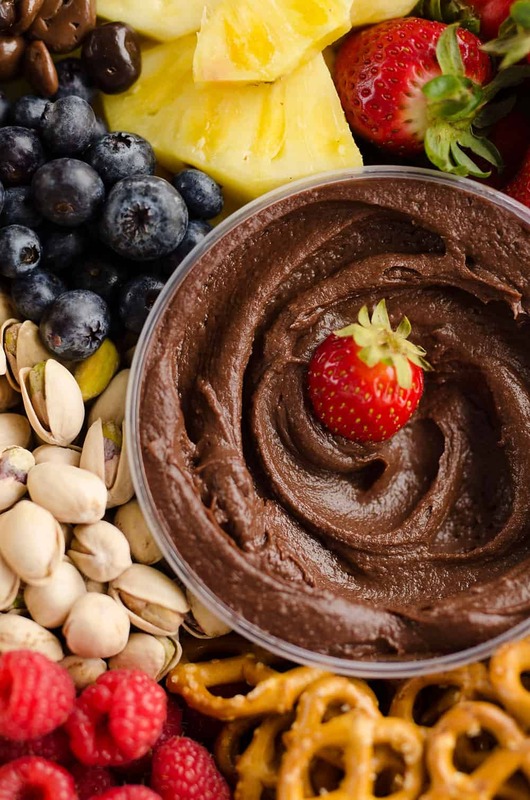 Anything you would dip in chocolate is perfectly paired with this Dark Chocolate Hummus. For this Healthy Fruit & Chocolate Party Tray, I paired the creamy dip with fresh fruit, pretzels, crackers, nuts and more. I added a few fun additions like chocolate covered raisins as well to pair with the platter along with a cheese and cracker spread. You can make this healthy appetizer all your own with a selection of your favorite dippers. 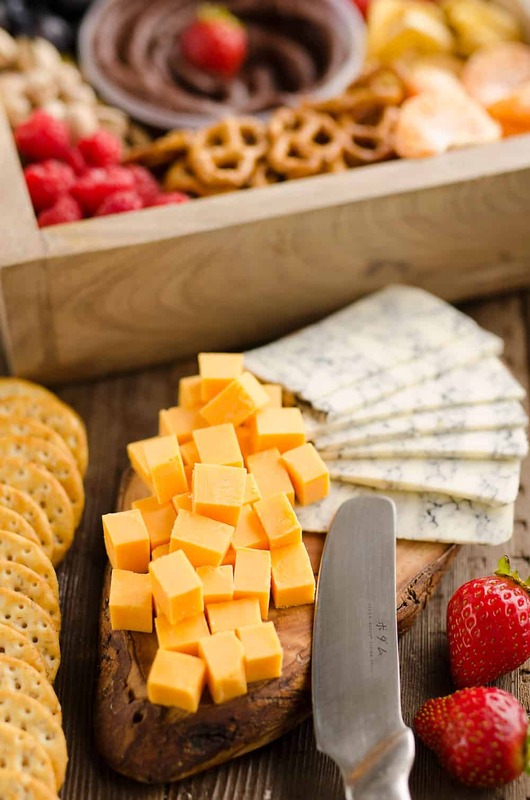 Cheese is an obvious choice to pair with any party spread including fruit and crackers. I served a Boar’s Head Bold MarBleu and Sharp Wisconsin Cheddar to add a nice variety to please various pallets. 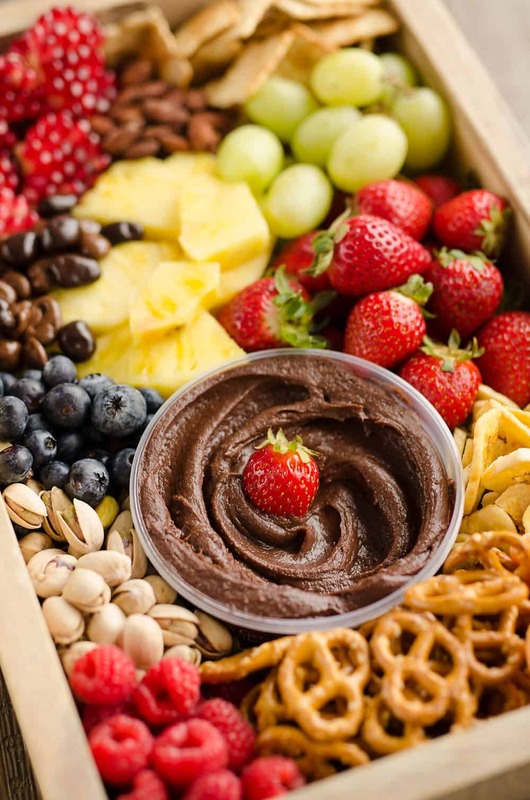 Between the fruit, dark chocolate hummus, crackers and cheese, you have got everything you need for a guilt-free party spread that is sure to impress! 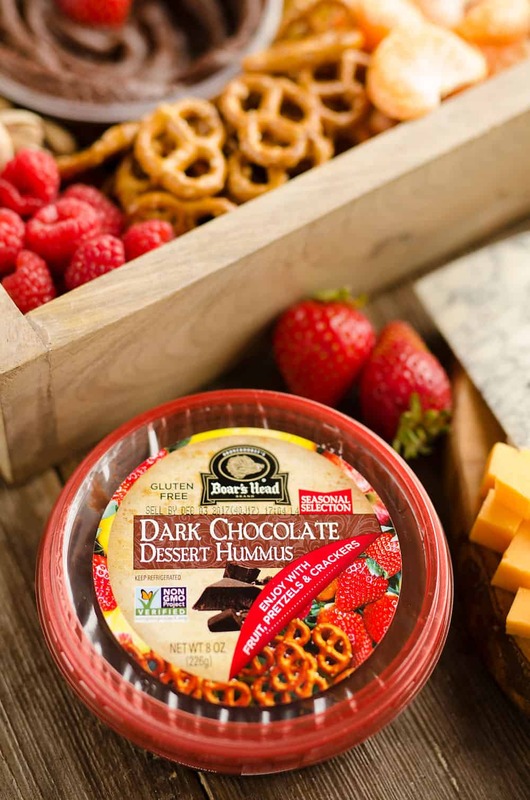 Now go hit up your local grocery store and snag a tub of this Boar’s Head Dark Chocolate Hummus to make this Healthy Fruit & Chocolate Party Tray while you still can! It is the perfect addition to any party or social gathering. This unique hummus is only being offered for a limited time, so I know I will be stocking up for all my upcoming holiday gatherings! 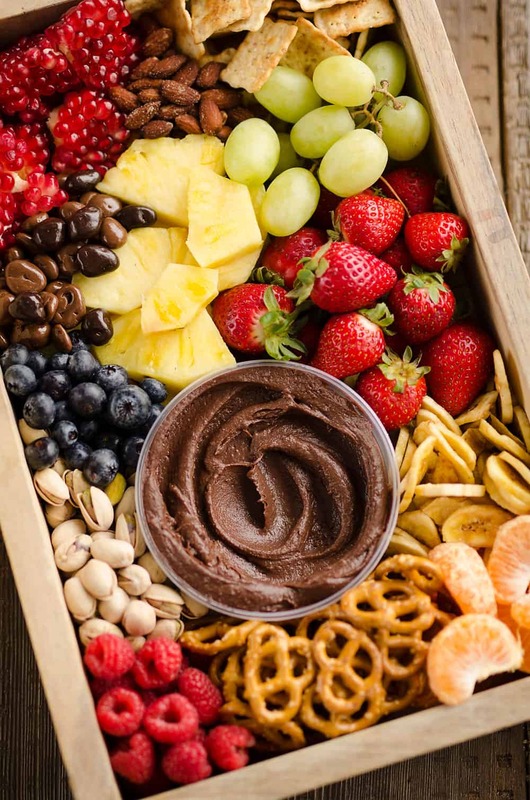 On a large platter, serve the Boar's Head Dark Chocolate Hummus surrounded by your choice of fresh fruit, dried fruit, crackers, pretzels, nuts, etc. I didn’t even know chocolate and hummus could go together!! I have got to try this asap!!! WOW!! What a great looking snack tray!!! I had no idea hummus and chocolate were a thing!! YUM!! Trying immediately!!! 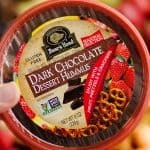 Chocolate hummus sounds intriguiging! I totally want to try it now! Dessert hummus with CHOCOLATE?! I am totally on board for that goodness! And this party tray! What a delicious thing to serve at any get together this festive season! I absolutely love this tray. What a perfect combination, something for everyone to enjoy.